Jonathan Romero, aka Dead Romeo, was the lead singer of the 80s rock band The Dead Romeos. But that was before a mysterious set of circumstances turned him into a vampire and sent him straight to Hell. Now hes back on Earth and he has a difficult choice to make: Kill his true love and earn his permanent release from eternal damnation – or protect her and burn for eternity. Either way, someone is going to die! 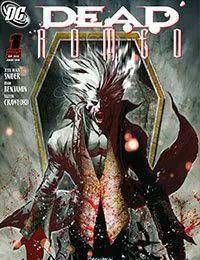 Its vampires, romance, rock and dismemberment like youve never seen before!<br />Jonathan Romero, aka Dead Romeo makes a deal in Hell and comes back from the grave. He meets Whisper and walks into town with her. They depart and “Dead Romeo” heads to a bar to meet up with his evil vampire buddies. They have a mission to complete that allows them to stay out of Hell. They decide to catch a quick snack, which seems to include Whisper. Will “Dead Romeo” partake?